Birmingham gets a lot of unfair stick. People say the city centre looks like a giant shopping centre and moan about how it’s overrun by motorways, mega-clubs and football stadiums. It’s “more canals than Venice” claim is [almost] a national joke. Even Mike Skinner got a bit mockney to avoid admitting he was a Brummie. 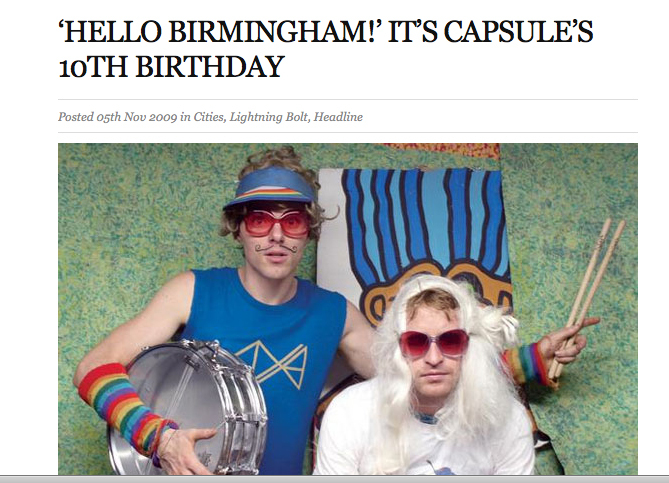 10 Years of Capsule definitely won’t be adopting any faux accents anytime soon. They are Birmingham’s best experimental music producers, creating the likes of The Supersonic Festival and”The Home of Metal”. They’re making sure sure that the midlands doesn’t go ignored when it comes to innovative sounds.